The musical of Roald Dahl’s James and the Giant Peach premiered in 2010 at the Goodspeed Opera House. A substantially revised version was presented last year at Seattle Children’s Theatre and this year Toronto’s Young People’s Theatre is giving the work its Canadian premiere in its new form. 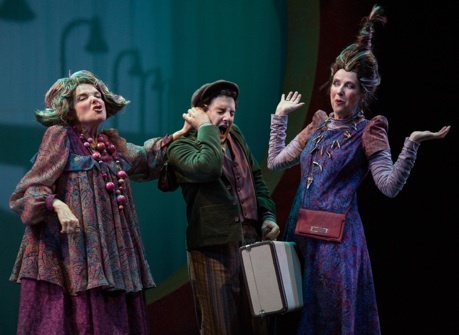 Sue Miner’s production is imaginatively designed and well-directed, but the musical does not overcome certain flaws in Dahl’s book and even adds some of its own. James and the Giant Peach from 1961 is only the second of Dahl’s 17 books for children and, unlike a later book like Matilda from 1988, shows more of an interest in surreal fantasy than it does in character. The main difficulty in making James into a stage show is that, unlike the title character of Matilda, James is largely a passive character to whom much happens but who takes little action. As a result, James’s setbacks and triumphs are not due to anything he does but to external circumstances. A stage version of the story can dramatize these circumstance as does the Pasek and Paul musical, but it still gives children no hero they can root for as they can a Tom Sawyer or an Anne of Green Gables. For those unfamiliar with the story, James Henry Trotter (Alessandro Costantini) has a happy life until the age of 4 when both his parents are eaten by a rampaging rhinoceros escaped from the London Zoo. After a time in an orphanage he is sent to live with his only remaining relatives, two maiden aunts Spiker (Nicole Robert) and Sponge (Karen Wood), who make their money through pickpocketing and petty theft. For three years they beat and verbally abuse him and treat him as their slave. All this changes when one day a mysterious Old Man (Dale Miller) appears and tells James how to make a magic potion. Rather than drinking the potion as he is supposed to, James spills it on a barren peach tree near his aunts’ house that immediately starts growing an enormous peach. It is so big that one could crawl into in, which James does when he sees a hole in it. Once inside the hollow pit, he sees it is inhabited by human-sized insects – a Ladybug (Lana Carillo), a Spider (Saccha Dennis), an Earthworm (Jacob MacInnis), a Centipede (Dale Miller) and a Grasshopper (Stewart Adam McKensy). They also hate the aunts and become James’s friends. Ruining the aunts’ plans to cash in on this anomaly of nature, the Centipede gnaws the peach free of the tree and it rolls into the English Channel and eventually to the United States, where becomes impaled on the top of the Empire State Building and James and his friends start a new life. As a narrative, the first problem is that James is freed by a deus ex machina in the form of a wizard who never appears in the story again. Timothy Allen McDonald, author of the musical’s book, could have remedied this problem by having the wizard reappear at important moments to suggest that what happens to James is actually part of the wizard’s plan, but McDonald does not do this. McDonald does make certain characters reappear in the story contrary to Dahl’s book, but in this case it only causes confusion. In Dahl’s book, Spiker and Sponge are killed when the giant peach rolls over them on its way to the sea. This is also what Sue Miner’s production seems to show. It is then rather a surprise to find them alive later on and discussing what to do now that the peach is gone. Given that they have only eked out a living by theft it is even more surprising to find that McDonald places them on the Queen Mary on a crossing to New York to start a new life. It is there in New York that McDonald decides to have the aunts killed when the peach falls from the Empire State Building. McDonald obviously does want to get rid of the book’s chief villains as soon as Dahl does, but reviving them means he has to lose the focus of Dahl’s book where the giant peach is lowered from its height and helps to feed thousands of hungry children who become friends with the once lonely James. McDonald’s book emphasizes the rather more subversive side of Dahl’s novel concerning family. Just because he is related to Spiker and Sponge by blood, does not mean James has anything in common with them, whereas by their mutual respect for each other James finds a new, more loving family among the insects inside the peach. These insects are so diverse that they include the Earthworm, who tells James that it is both a boy and a girl (a fact, no matter how true, that the audience of children reacted to with a collective “Eeuw!”). This could make for an interesting discussion in class, but to make this fact more persuasive, McDonald could have avoided Dahl’s mistake of making herbivorous rhinoceroses carnivorous, but he does not. Pasek and Paul’s music, written in a generic post-Sondheim, post-Kander style is pleasant during the moment but immediately fades from memory once it is over. What will stay in the theategoer’s memory much longer is Yannik Larivée’s impressive design. The entire stage is framed by two parentheses that we realize are the shape of two side of a peach. Midstage is a wall with a large peach-shaped cutout with a curtain behind it concealing a screen. There Miner stages some of the more complex action scenes using shadow puppets, such as the rhino attack on James’s parents or the giant peach rolling down the hill over James’s aunts. Set elements pivot into the peach cutout from either side – the aunts’ decrepit house and barren peach tree branches. One of the most imaginative effects Miner creates with lighting designer Jason Hand. The magical peach when it first appears is a light shining through the screen on an object behind it. We see the peach grow in stages ever bigger until it fills the entire peach-shaped cutout. The midstage wall then becomes a side of the giant peach and the acting space in front is the area inhabited inside it. Robin Fisher has created an array of wonderful costumes along with puppets for the Ladybug and Grasshopper before they are magically enlarged. Especially clever are the costume for the life-sized Ladybug and the Spider, where the actor has two pairs of extra arms attached to her own arms to give the beast eight limbs. Alessandro Costantini makes the quietly passive James quite sympathetic. Alessandro does show that James gains in confidence when he is surrounded by a supportive group like the insects, so that James’s decision to rescue the Centipede when he falls overboard into the sea becomes a personal triumph for his character. Nicole Robert and Karen Wood make Spiker and Sponge so nasty they seem more like witches than simply evil human beings. During their introductory song when they describe the joys of thievery, it would help if Miner had them plying their trade on passers-by so we could see the two in action. Both are prone to over acting but that is perhaps part of the fun of playing a villain in a children’s show. All of the cast are fine singers. Stewart Adam McKensy is a standout for the warmth of his voice. The two most interesting insects are the Centipede and the Earthworm. Dale Miller shows that the Centipede has anger management problems and can’t get along well with a group. His belief that others don’t like him makes him act unkindly to others. Therefore, when James rescues him, Miller takes the chance to show us a a real change of character. Jacob MacInnis’s Earthworm also undergoes a change. At first shy and fearful, he summons what little courage he has to try to tempt seagulls down to the peach so Spider can harness them. This change, so well expressed in the song “Plump and Juicy”, is the musical highlight of the show. In YPT’s production the visuals go a long way to make up for the passive hero and the forgettable music. The music might have more impact if certain audio problems were solved. We can hear the actors’ voices well when they sing alone, but in groups of two or more their words become completely blurred. Fans of Dahl and of obscure musicals will certainly want to see the show as will those looking for a family show that, for a change, does not have a holiday theme. Photo: (from top) Saccha Dennis, Lana Carillo, Dale Miller, Jacob MacInnis, Stewart Adam McKensy and Alessandro Costantini; Karen Wood, Alessandro Costantini and Nicole Robert. ©2014 Cylla von Tiedemann.